“Faith In the Future”: a vividly illustrated journey of Faith and her thrilling and insightful circumstances during her birthday. 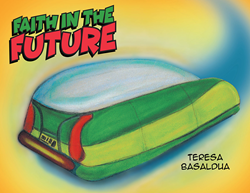 “Faith In the Future” is the creation of published author, Teresa Basaldua, an elementary school teacher and a dedicated writer and storyteller. Published by Christian Faith Publishing, Teresa Basaldua’s new book also tells of the wonderful relationship between a grandparent and a grandchild in sharing the much-needed unconditional love and family support. Witness Faith as she receives an unexpected gift from her grandmother that inspires her with thought-provoking lessons that are worth remembering forever. View a synopsis of “Faith In the Future” on YouTube. Consumers can purchase “Faith In the Future” at traditional brick & mortar bookstores, or online at Amazon.com, Apple iTunes store, or Barnes and Noble. For additional information or inquiries about “Faith In the Future”, contact the Christian Faith Publishing media department at 866-554-0919.